Liquid Pool Covers - If my pool is small, how long will Ecosavr last? Across the world, the definition of a "small" pool may change, but for the purposes of this blog post, I am imagining a small pool being less than 400 square feet (or less than 15,000 gallons), probably either an above ground pool or a swim spa. Probably not a kiddie pool like the one in the image, but something compact that a family can enjoy throughout the hot summer months. Small swimming pools are often not heated, and rely on the power of the sun to keep the water warm. In areas that are plagued with cool evenings this can be a challenge, and that is where EcosavrTM comes into play. Swimming pools lose the majority of their heat through the process of evaporation; the heat quite literally vanishes into thin air. EcosavrTM, the liqud pool cover fish, helps swimming pools reduce the rate of evaporation, which helps to keep the heat in the pool water. Using this product can help a swimming pool retain approximately 50% of normal overnight heat loss. Residential swimming pools of up to 400 square feet, or 15,000 gallons of water, require only 1 EcosavrTM fish per month to keep their pool covered. The small plastic fish is added to the pool, where it will sink to the bottom, and the liquid cover is slowly released throughout a one month period of time. 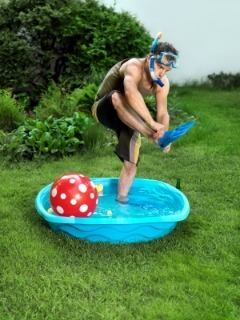 The recommended retail price on this item is only $12, so it is a very cost effective means of keeping your pool water warm enough to swim in. A common follow up question is this: what if my pool is smaller than 15,000 gallons - how long will EcosavrTM last in my pool? To use the product, you first have to snip the top fin of the fish. There is a valve in that fin that allows the liquid inside to slowly leak out into the swimming pool. Regardless of the shape or size of your pool, the liquid will leak out at the same rate. This means that EcosavrTM will last for 28 - 30 days in a swimming pool of any size. The difference is not going to be in how long it will last, but in how effective it will be. The same amount of liquid cover will be released, whether the pool is 200 square feet or 2000 square feet. That same amount of liquid will try to cover the entire surface area of the pool. Flexible Solutions has been manufacturing this product for just over 20 years now, and we have done enough tests to know that the amount of liquid inside an EcosavrTM fish is enough to adequately cover a 400 square foot backyard swimming pool. If it is added to a smaller pool, there will be more product covering the surface, possibly allowing for slightly better results. If the pool is larger, the same amount of product will be stretched thinner across the surface, possible resulting in slightly lower savings. Will this product affect, or be affected, by the water traveling thru solar panels? No, liquid pool covers will not affect or be affected by solar roof panels. Using our products in conjunction with a solar system is a great way to maximize and retain the heat gain, keeping your water warmer for a longer period of time! Many solar systems are currently functioning very well while working side-by-side with both Heatsavr and Ecosavr. No, our liquid pool covers will not affect your solar panels in any way but to help them out! Using solar is a wonderful way to gain heat in your swimming pool, and using Ecosavr or Heatsavr will help keep that heat where it belongs - in the water! If I use your products on an irrigation storage pond, will it be toxic to plants? Honestly, our liquid pool covers are not recommended for use on anything but swimming pools. We do have a sister product, however, that is developed specifically for potable water like irrigation storage ponds. If you are interested, you can check out http://flexiblesolutions.com/products/watersavr/ for more information. Great explanation about liquid pool covers. 20-year experience really means great dependability. More power! Thanks! We really believe in our products, mainly because of such a strong history of success!